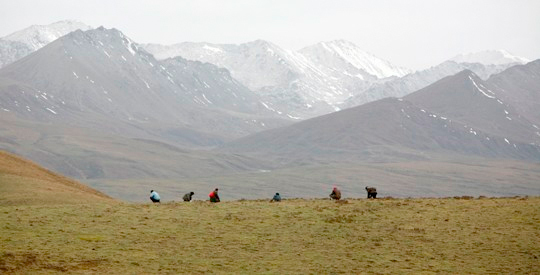 The year before I was smuggled out of Tibet in 1984, my brother and his friends were talking about going to pick up yartsa gunbu in the hills near our village. They refused to take me with them saying that I could not climb up the hill. When I threatened to tell on them to my grandfather, they allowed me to tag a long. We climbed up the hill, negotiated the ruins of the monastery destroyed during the Cultural Revolution (1966-76) and reached Gyalpo Ri or the King’s Peak. It was winter and the earth was frozen. We did not find a single yartsa gunbu. At the time, I did not know how the thing even looked like. this is what the precious fungus looks like! 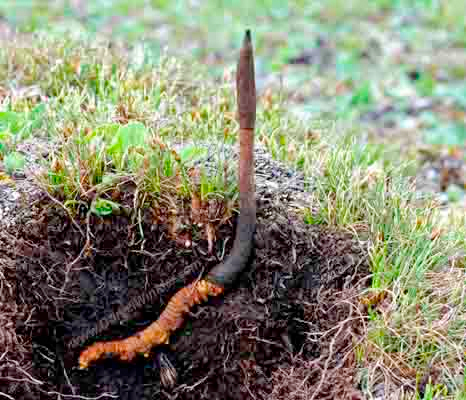 Yartsa Gunbu meaning Summer Grass Winter Worm is popularly known as caterpillar fungus/grass. This fungus, which is found in wild on the Tibetan Plateau, takes over the bodies of caterpillar larvae then shoots up like finger-size blades of grass out of the dead insects' heads. The nutty-tasting caterpillar fungus is highly valued for its supposedly extraordinary curative powers such as a treatment for cancer, anti-aging and as a libido booster. This Tibetan aphrodisiac is widely used in traditional Chinese medicine and is particularly coveted by the nouveau riche in China today. As a result, demand for the exotic fungus has sky-rocketed in far away booming cities like Beijing and Shanghai. By one account, the value of caterpillar fungus has shot up by 900 percent since the late 1990s. Will Xi Talk to Dharamsala? In 1954/55, when His Holiness the Dalai Lama visited China, he is said to have gifted a Rolex watch to Xi Zhongzun, the then vice premier of China. In 1980s when Tibetan fact-finding delegations from Dharamsala went to China and Tibet, Xi was the Chinese official interlocutor and was known to carry a photo of His Holiness in his pocket. Xi was close to the 10th Panchen Lama, who submitted the historic 70,000 Character Petition to the Chinese government stating that Tibetans suffered more under Beijing's rule then they have benefited. His association with the Panchen Lama was one of the reasons why Mao purged him three times. Xi also supported Hu Yaobang’s political reform and denounced the use of military force in Tiananmen Square in 1989, after which he disappeared from public. By all account, Xi Zhongxun, was a liberal communist, who is known for his integrity and forthrightness. 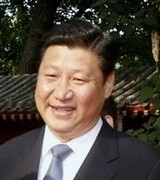 Xi’s son Xi Jinping will takeover the communist throne in Zhongnanhai from the current Chinese boss, Hu Jintao, in 2012. Xi junior was born in 1953 and later witnessed Mao purge his father during the Cultural Revolution. His climb up the Communist ladder has been slow and un-dramatic. Xi joined the Chinese Youth League in 1971 and the Communist Party in 1974. After nearly three decades later, he took senior Party position in Zhejiang, one of the rich Chinese provinces and was made the Party chief of Shanghai in 2007. In October of the same year, Xi was inducted into the Politburo Standing Committee, a nine-member all-powerful group that decides the fate of world’s most populous nation. Chinese authorities sentenced influential Tibetan writer Tashi Rabten, popularly known as Theurang, to a 4-year jail term in Eastern Tibet. 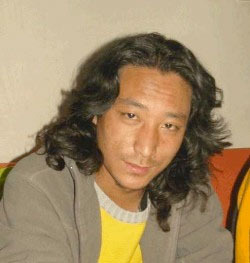 Theurang is the author of Written in Blood and one of the editors of banned literary magazine 'Shar Dungri' (Eastern Snow Mountain). He was arrested from the Northwest Nationalities University in Lanzhou on 6 April 2010. Following poem (translated into English by Bhuchung D. Sonam) is from his book Written in Blood.